This past week I made my first visit to NPA’s clearance operations in Kumsangir district, along the Tajik-Afghan border. This border is the most heavily mined area of the country, a result of Russian efforts to limit cross-border flows of Taliban, Islamic Movement of Uzbekistan (IMU) fighters, and other insurgents during the civil wars (both in Afghanistan and Tajikistan) of the 1990s. As it happens, it is also the most favourable area in the country for demining operators to work. The terrain along much of the western Tajik-Afghan border is flat and easily accessible by vehicle, and the initial surveys of minefield locations were able to draw on recent and accurate Russian maps. The contaminated land is therefore highly concentrated, has well-defined boundaries, and is easily accessed by demining teams. By comparison, cluster munitions contamination in the central region of Tajikistan is spread over a larger area, with unknown concentrations, and is situated in a harsh climate with inaccessible terrain. 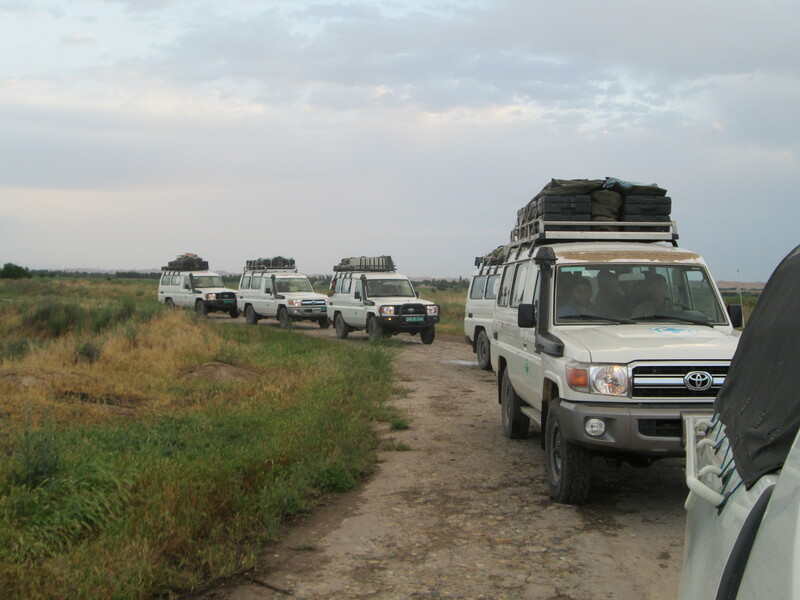 NPA has been working here since 2010, after being invited by the Tajik Government to assist with demining and technical survey operations. In 2013, they have deployed eight demining teams (six military, two civilian), each consisting of eight deminers plus a team leader. I was fortunate to be visiting in April when the arid valley still had a pleasant spring-time feel, not yet hit by the scorching heat of the summer months. My trip to Kumsangir coincided with a site visit by Mr. Rodney Robideau, Program Manager for Central and South Asia of the U.S. Department of State Office of Weapons Removal and Abatement, along with members of the OSCE (Organization for Security Cooperation in Europe), and the U.S. Embassy in Tajikistan. During their one-hour visit, NPA Operations Manager Daler Mirzoaliev gave a briefing on NPA’s history and current activities in Tajikistan, capacity-building efforts, and the new equipment being used in field operations (including new protective blast masks, new metal detectors, and a digitalized progress reporting system). By a happy coincidence, the minefields where NPA demining teams are currently working in 2013 happen to be unusually dense, so NPA was able to report impressive landmine clearance statistics (over 185 anti-personnel landmines, for example, had already been discovered and destroyed that week alone). The operations team also made a point of demonstrating the advantages of the digitalized progress reporting system, which (in theory) allows each demining team to accurately report on a daily basis information on land area cleared and UXOs discovered. This system has obvious advantages from a donor’s point of view, where a high premium is placed on being able to report tangible project outputs at a moment’s notice. Mr. Rodney Robideau – USDoS – checking out NPA’s digital reporting system. NPA humanitarian deminer at work. So what did I learn on this trip? 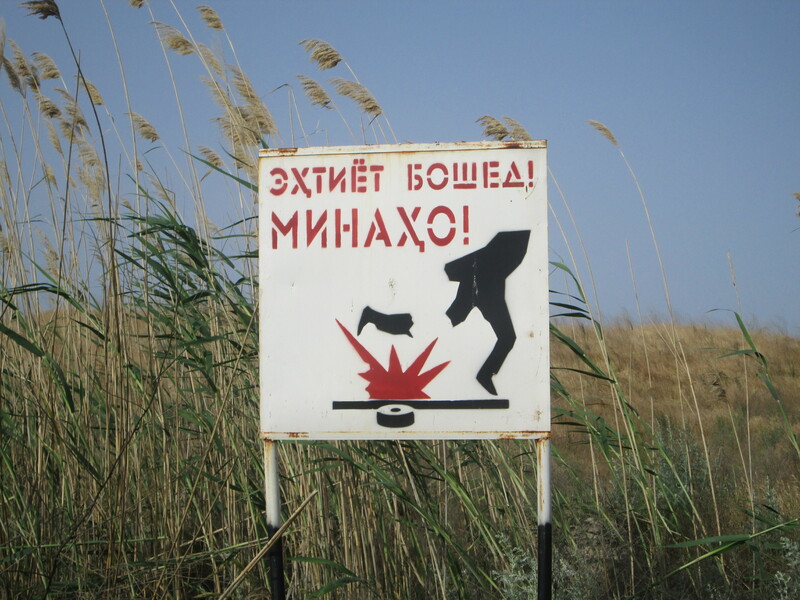 Certainly, I have a better appreciation for the level of expertise, investment, and oversight necessary for a properly functioning landmine clearance operation, even under the relatively favourable conditions of the Tajik-Afghan border. The necessary attention to detail and the logistical preparations that go into training, deploying and ensuring quality control for 8 teams of deminers working simultaneously are considerable, especially given the very narrow margin for error in this line of work. 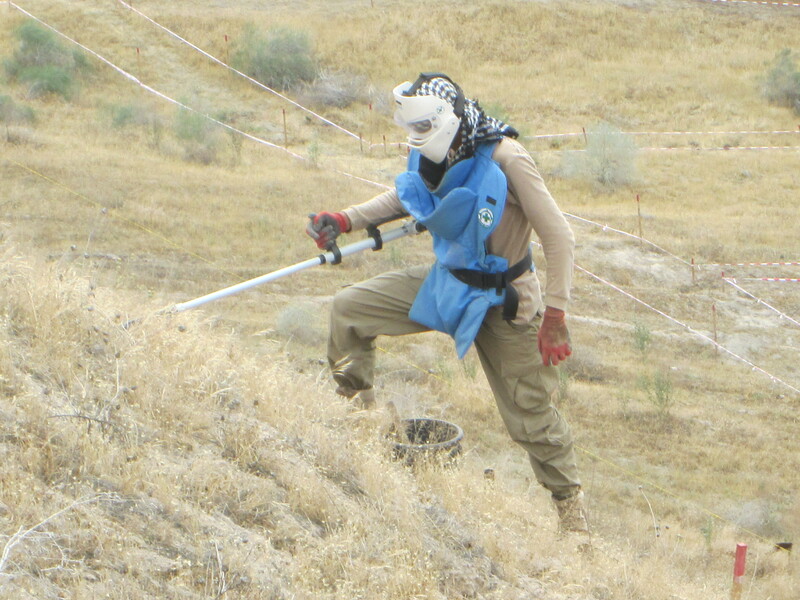 The problem of quality control is particularly challenging since very few of the national deminers have prior experience (like many young Tajik men, recruits from previous years end up leaving to find work in Russia), so training essentially begins from scratch each season. The visit by the U.S. Department of State also highlighted the larger story unfolding in Central and South Asia in anticipation of the withdrawal of NATO and U.S. military forces from Afghanistan in 2014. Deteriorating security conditions in Afghanistan, either due to renewed civil war with the Taliban or the internal destabilization of Hamid Karzai’s government after the 2014 elections, would have far-reaching ramifications for the rest of Central Asia. Tajikistan, along with neighbouring Uzbekistan, could face increased inflows of Afghan refugees and greater cross-border movements of armed insurgent groups, shocks which could further destabilize already fragile states. Consequently, there has been increased focus among Western powers in turning to a regional approach in Central/South Asia, including shoring up the level of border security among Afghanistan’s neighbours. The USDoS visit was therefore an important opportunity for NPA to showcase its competency as a capacity-building partner of the Tajik Ministry of Defence, National Guard, and Committee of Emergency Situations, from which the majority of NPA’s staff are recruited (with funding from Norway expected to be reduced substantially over the next two years, it will become especially important for NPA to build closer relations with other potential donors). More photos from the visit can be found here.